Inspired by our celtic muse, Liz begins prototyping some celtic knotwork designs as a first step as towards exploring how we might decorate our Carolan guitar. So it’s out with the sketch pad and time to start drawing. Early ideas soon take shape and lead to a series of initial aestheticode celtic knot motifs. Liz notes that the repeated but varied toplogical patterns of celtic knots make them an excellent, if somewhat challenging, puzzle for an asthetheticode designer. So we are challenging you to figure out the artful ways in which Liz has managed to embed different codes within her knot designs. Major kudos (but not a free guitar) to the first person who can post a comment telling us which codes are embedded into the above (hint: you might figure it out by eye or perhaps more simply download the Aestheticodes app and scan them from the screen). Far more Kudos to anyone who can create and post their own design that scans successfully! 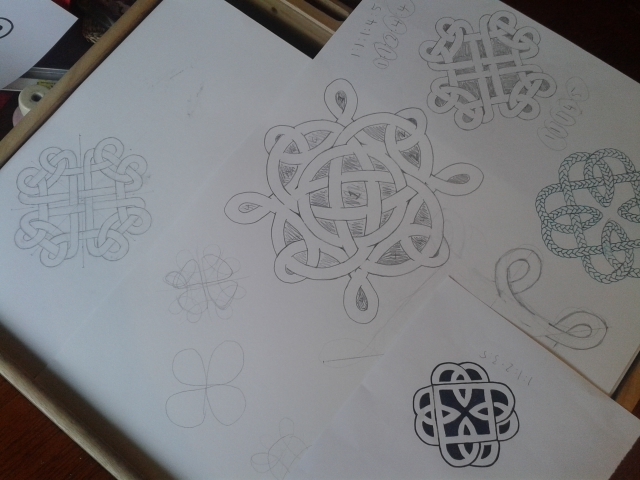 Liz Jeal has designed some lovely prototype celtic knots for decorating our ‘Carolan’ interactive acoustic guitar.